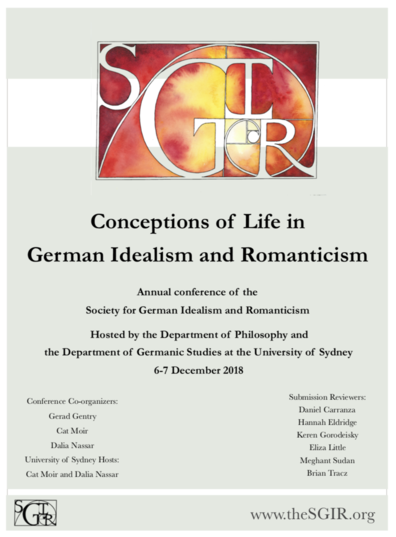 We are glad to give notice that the Society for German Idealism and Romanticism Annual Conference “Conceptions of Life in German Idealism and Romanticism” will take place at the University of Sydney, on 6th-7th December, 2018. This conference is jointly hosted by the Department of Germanic Studies and the Department of Philosophy at the University of Sydney. Here you can find the full Conference Program. All SGIR conferences are free, but registration is required. Please check this link.